Truth Entrygard Dual Arm Operator. 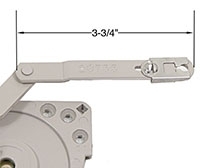 We would expect you to find 20755 on the linkage arm, which measures 3-3/4" overall length. Other common numbers we would expect to find are 31538, 31539, 30841, 30842, 30472, 30470, and 20755. Call or email for quantity "Discount Codes".